Just in time for holiday treats…this is the perfect homemade topping. In a large bowl, with a sturdy whisk (you could use an electric beater, I don’t have one), empty the solid contents of the coconut, reserving the liquid for something else (smoothies, nut milk etc). I actually used the remaining liquid, which was about a 1/2c to make a cashew nut milk for the Chocolate Moose I made the whipped topping for!!! Break up the solid coconut with the whisk and begin to beat it as rapidly as you can. About mid way, add the sugar, salt and vanilla. I add the sugar incrementally- depending on how sweet I want the end cream to be. I was serving this with the Coconut Chocolate Moose so I didn’t want it to be too too sweet so I ended up adding 2 T of raw agave. Taste and adjust for sweetness. Transfer into a storage container. It will stiffen after being chilled and it will also soften at room temperature. AMAZING. 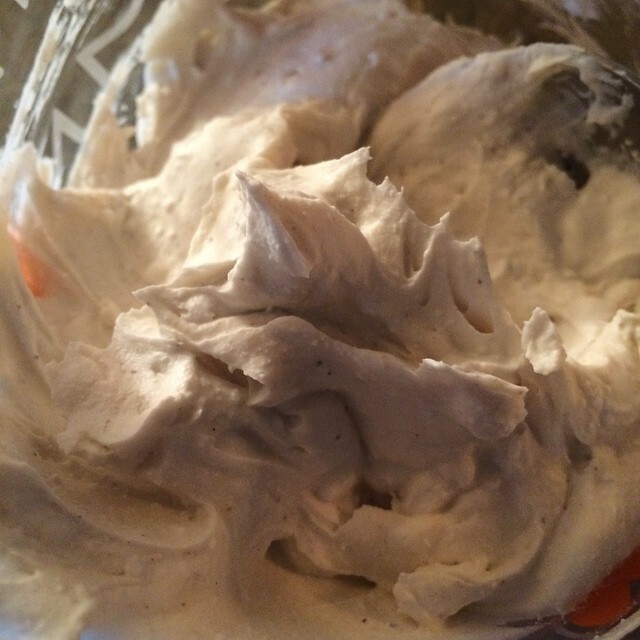 This entry was posted in desserts, sweets and tagged coconut, dairy free, dessert topping, vegan whipped cream, whipped cream. Bookmark the permalink.